Wellington, July 27 NZPA - Career diplomat Rod Harris will be New Zealand's next ambassador to Saudi Arabia accredited to Bahrain, Kuwait and Oman. 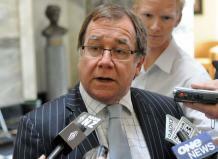 Foreign Affairs Minister Murray McCully said Saudi Arabia had a long-standing and warm relationship with New Zealand. Two-way trade with Kuwait was worth $245 million, with Oman $131m and with Bahrain $89m. Mr Harris is currently deputy head of the International Trade Unit at the Ministry of Foreign Affairs and Trade. He previously served in Seoul, South Korea and as a legal adviser to the Commonwealth Secretariat in London. He succeeds Trevor Matheson in Riyadh.